“I would love to read blogger’s thoughts on who they like to have heal them. Would you prefere a Holy priest of a Disc priest? A Holy pally or a Resto druid. Shammy maybe? As a disc healer, I know how I feel about my healing. How do you feel about who’s healing you? And this week’s contributors are! 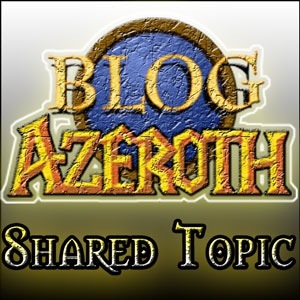 Have a Shared Topic you would like to suggest? Got something to contribute to an existing one? Make sure you visit the Blog Azeroth forums! I just want a healer that pays attention, they can be anyone at all. In a lot of groups, be it raid or battlegrounds, healers put very low priority on their DPS dealers, particularly mages like me. I know we’re not the highest priority, but if we don’t get a single heal and keep having to be res’d, it defintely slows down the group’s overall damage.